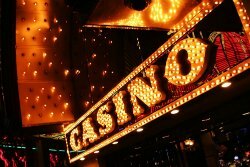 Want to avoid getting hosed at the casino? Home > hormonology tip > Want to avoid getting hosed at the casino? 04 Sep Want to avoid getting hosed at the casino? If you want to enjoy the fun of gambling, but also want to avoid going bankrupt or walking away full of regrets, head to the casino during Week 3 of your cycle, which starts about 15 days after the onset of your period (right after ovulation). An interesting study in the European Journal of Neuroscience reveals that high levels of progesterone in this phase dampen the thrill you get from winning, which can help make you more practical so you make more reasonable bets. But, it also dampens the pain of losing, so at least you don’t beat yourself up too much if those reasonable bets don’t end up paying off. By comparison, rising estrogen in Week 1 and Week 2 of your cycle (the first half of the month starting with the onset of your period) make you far more impulsive and optimistic, so you’re likely to make wild bets that have a long shot of paying off. And plunging estrogen in your premenstrual Week 4 can saddle you with remorse if you end up losing a bundle.